Production for M. Night Shyamalan's Unbreakable sequel Glass is currently underway in Philadelphia and we now have our first look at Samuel L. Jackson as an elder Elijah Price. Fans have been waiting a long time for this, so this is certainly exciting news to see the 68-year old Jackson back as the mysterious comic book collector who was (rightfully) convinced that a regular person, David Dunn (Bruce Willis), has extraordinary superhero powers. 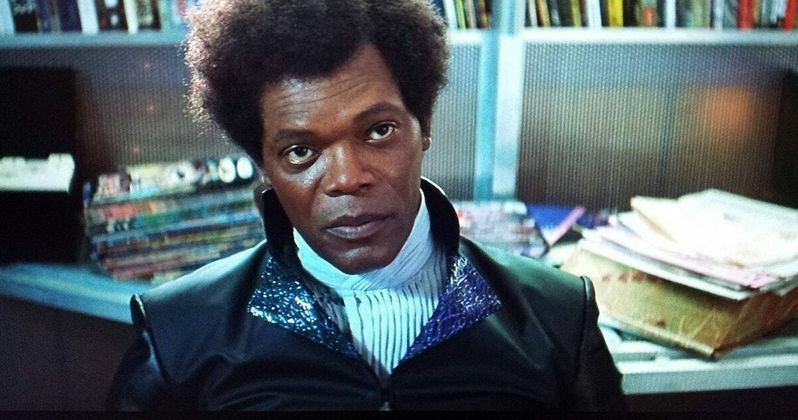 Many fans hail Unbreakable as one of M. Night Shyamalan's greatest movies, if not the best. When M. Night Shyamalan's Split was released last year, many had a bit of a shock at the post-credits scene. Bruce Willis' David Dunn character is seen in a diner watching the news on television about the arrest of James McAvoy's Kevin Crumb character, who hides multiple different personalities. We learn he'll be placed in the same institution as none other than Samuel L Jackson's Elijah Price, aka Mr. Glass. The scene was enough for fans to speculate that they were finally getting a sequel to Unbreakable, which Shyamalan confirmed in the form of a sequel to Split as well. Filming is taking place in Pennsylvania and we now have our first proper look at Samuel L. Jackson as the elder Elijah Price after all of these years of speculation and practically begging of M. Night Shyamalan to produce a follow up to Unbreakable. Jackson is shown in a wheelchair in a purple suit with purple gloves, revealing that Mr. Glass has not let his fondness for purple fade over the years. In other set photos, we see James McAvoy wearing a long-haired black wig, that may or may not be shown as a joke. Related: Can The Kid Who Would Be King Smash Through Glass at the Box Office? Glass has been 17 years in the making according to M. Night Shyamalan and he's said that he gets "emotional" seeing all of the cast together again, along with the newcomers on set. As for the set, Shyamalan chose to film in Philadelphia once again in an abandoned Allentown hospital. The hospital has been vacant for many years and looks as if it's the perfect place to film the follow up to Split and Unbreakable. The former psychiatric hospital was built in 1912 and closed in 2010. Split was seen as a return to form for director M. Night Shyamalan and it was solid at the box office. But Glass is shaping up to be a monster and these new set photos have just upped the hype meter for fans that have been waiting 17 years for a proper follow up to Unbreakable. Glass will be the final installment in the trilogy, which will tie in Split to the same world as Glass and Unbreakable and will find Dunn on the trail of James McAvoy's serial killer The Horde and Jackson's older Elijah Price. You can check out some photos from the set of glass, featuring our first look at Samuel L. Jackson as Mr. Glass, below, courtesy of Cario's Twitter account.